"To be deep in history is to cease to be a Protestant." One area where detractors of the Catholic Faith direct the most attacks is at her history. Secular humanists hold up events like the Galileo affair in an attempt to show that the Church is against "progress"; the Crusades are put forward by pro-Islamic apologists as an example of Christian jihad; Protestants consistently draw upon lurid tales of worldly popes from the Renaissance or the 10th century as evidence in support of their condemnation of the papacy as the Whore of Babylon; anti-Catholic polemicists attempt to mar the reputation of Pius XII regarding his role in the holocaust. These historical attacks are veiled doctrinal attacks. A condemnation of the Crusades is really a veiled way of saying, "The Catholic Church has abandoned Christ's precept to love our neighbor." A polemicist who brings up the Galileo affair is not just criticizing the way the Church behaved four centuries ago, but is sending a message to Catholics today: "The Church was wrong then. It can be wrong today." Not to say that the Church has not made some prudential errors over the centuries. But too often, the truth of history is obfuscated to serve the ends of anti-Catholic agitators who would use the history of yesterday as a means of tearing down the Church of today. It is my hope that, through this page, Catholics can at least find a trustworthy account of our own history and see that, far from being ashamed, our history is one of the most glorious treasures of the Church. Scientists Executed by the Catholic Church: In this essay we review the lives of ten scientists who came into conflict with the Church to determine whether or not the Catholic Church killed scientists merely for their scientific opinions. Is Easter Pagan? The Eostre-Easter Connection: In De tempore ratione, St. Bede suggests that the name of Easter may have been derived from the pagan goddess Eostre. We delve into this question, sorting through history and etymology to determine what, if any, pagan nomenclature has survived in the Christian Feast of Easter. Ecclesiastical Medieval Land Ownership: What does it really mean when it is asserted that 'the Church' owned one third of all the wealth of Europe during the Middle Ages? Examining the great diversity of ownership, uses and benefactors in medieval ecclesiastical property. Deconstructing the Documentary Hypothesis: The Documentary Hypothesis - that the Pentateuch was composed almost a millennium later than Moses and not compiled until after the Exile - is based on faulty methodology and informed more by Hegelian assumptions about history than any hard facts. Read how history and archaeology debunk the beloved JEDP theory of the skeptics. The Truth About Priestly Continence and Celibacy in the Early Church: It is undeniable that married priests were a fact of life in the Early Church. However, modern proponents of a married priesthood miss the point entirely when arguing for a relaxation of current law by appealing to patristic practice. As this article demonstrates, while the Early Church tolerated married priests, they never tolerated sexually active priests - which is ultimately what the moderns are pushing for. Comparing Roman and Medieval Technology: Ryan Grant offers some insights on why the medieval approach to science was actually superior to that of the Romans, who actually had an anti-technological bias. Another argument smashing the myth that the onset of the Christian middle ages meant hostility to science. Pagan Origins of Christmas? Many ignorant people assert that Christmas is nothing other than a pagan holiday "stolen" by the Church, a baptized Roman solar feast, or perhaps a Celtic winter solstice festival with a thin Christian veneer. What can we say to these accusations by Protestant fundamentalists and other skeptics? 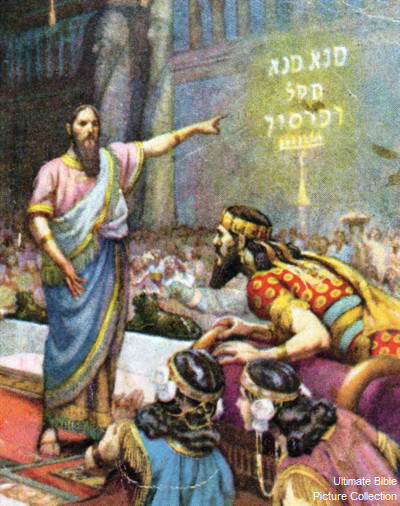 The Belshazzar Problem: The Book of Daniel states that the last King of Babylon was named Belshazzar and that he perished when the Persians sacked the city; ancient historians, however, state that the last King of Babylon was Nabonidus and that he was spared by the Persians. The inscriptions of the Nabonidus Cylinder in the British Museum shed light on this apparent contradiction and prove the veracity of the biblical narrative. Christianity and Mithraism: Getting to the bottom of the alleged borrowing of Mithraic doctrines and practices by Christianity. In fact, there is good evidence that Christianity predated Mithraism and that the borrowing may have went the other way. In any case, Roman Mithraism looks to have been a European invention, not some ancient rite carried west from Persia. Catholic Cleric-Scientists: Survey of some of the great Catholic priests who were also scientists and the contributions of Catholicism to the progress of science in general, debunking one of the common accusations against the Church - that she is an obstacle to real scientific development. On the contrary, modern science rests upon foundations laid by Catholic priests. Crusaders and Conversion: A thorough examination of the documentation regarding the use of force to bring about conversions in the Crusades and whether or not it is accurate to say that Crusaders "spread religion by the sword", as well as a comparison between medieval and modern views on the legitimacy of exercising coercion as an inventive to conversion. Catholicism's Eminent Persons (1600-1787): In this article we take a look at the very broad accusation that Catholicism stifles intellectual activity and leads to nations steeped in poverty and ignorance. This accusation is put up against some very solid empirical evidence that leads us to quite the opposite conclusion: Catholic countries actually have demonstrated a much more vibrant intellectual life than Protestant nations. Myth of the Religious Wars: The classical liberal narrative of western civilization would have us believe that democracy and secularism saved us from a barbaric age when men fought and killed each other over creeds, the so-called "Age of the Religious Wars." But, as this article will demonstrate, religious was only one of many motivating factors in these wars; in fact, nationalism and the emergence of the nation-state were much more prominent themes in these conflicts. The Papal Primacy in the First Councils: Examining and refuting the accusation that the primacy of the Pope was not recognized in the early Church, from a thorough analysis of the canons and acts of the first four ecumenical councils of Nicaea, Constantinople, Ephesus and Chalcedon. The Pope was indeed seen as leader of the universal Church and a tribunal of final appeal, not simply one equal among many. Jews Praise Pius XII. A brief selection of some of the many statements by Jewish leaders and organizations praising Pope Pius XII for his strong stand against totalitarianism and his efforts to ameliorate the condition of Jews persecuted by the Nazis during World War II. A strong antidote to those who suggest the pope was somehow apathetic or complacent towards Nazi aggression. Myth of the Ignorant Priest: Priests and bishops of pre-Revolutionary France are usually depicted as greedy, immoral and ignorant, but what does the historical record actually tell us about these men? When we begin to go by the testimony of contemporaries instead of Hollywood, we begin to see that the French clergy were not only competent, but were in many cases men of exceptional learning and personal holiness. Why Did Pagans Convert? : A two part refutation of the common secularist assertion that the growth of early Christianity can be accounted for by purely worldly reasons, such as patronizing the poor, elevating the status of women and, most of all, Roman roads. While these were all important, they were not the primary reason to account for the Church's growth.